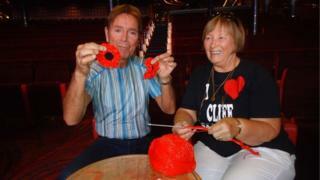 Sir Cliff Richard has knitted a poppy in aid of the Royal British Legion after a lifelong fan showed him how. Margaret Aiken, 69, from Warminster, said he had been her “idol” since she was 15, and she wrote to him as he was performing on a cruise she had booked. She said she heard nothing until she was on the ship and was contacted by his manager to say Sir Cliff could add some stitches before his sound check. 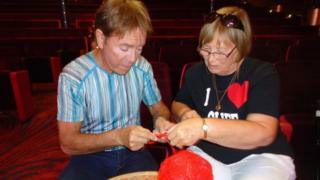 Mrs Aiken said: “I taught Cliff Richard how to knit”. She said she was “so overcome” her knitting needles shook. Mrs Aiken wrote to him about four weeks before her cruise holiday but when she boarded the liner “word was going round he wouldn’t be doing any meet and greets”. “I got quite emotional. We met in the theatre before his sound check and he told me he used to watch his mother knitting as a young child. Mrs Aiken said she’s planning to go to a disc signing he’s doing in Oxford Street in London on Friday. 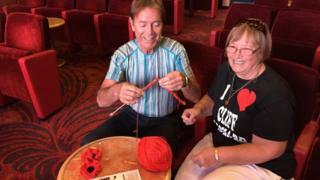 She is planning to raffle the poppy Sir Cliff knitted and is hoping he will have time to choose the winning ticket.